Hi, I'm Brianna and this is my blog. I'm a makeup artist + a blogger. Copyright 2011-2015 Brikasia. Powered by Blogger. Where my pale girls at? Summertime is the bane of our existence, mainly because regardless of how many times we've tried, it's straight up impossible to get tanner. And unfortunately for us, shades of red aren't trending yet. But thank goodness for bronzers! It's kind of our only chance to look like we have that "healthy summer glow" thing going on, which is a nice change from the constant "Are you sick? You look really pale," remarks we're used to getting. And it also doesn't hurt to mention that this is a million times safer than actually baking out in the sun. Skin cancer is such a downer, and avoiding the sun like the plague and turning to bronzers is probably the best thing you can do for yourself, regardless of whether you're pale or not. I've rounded up 15 of my favorite bronzers, which are not to be confused with contour powders, bee tee dubs ("btw" for those of you not in the know ;)). Remember, contour powders are completely matte and don't have an orange-tinge to them, and aren't made for making you look tanner. They're just there to help shave off a few pounds off the face. Bronzing powders are to bronze, which is why I only bust them out in the summer. Got it? Cool. 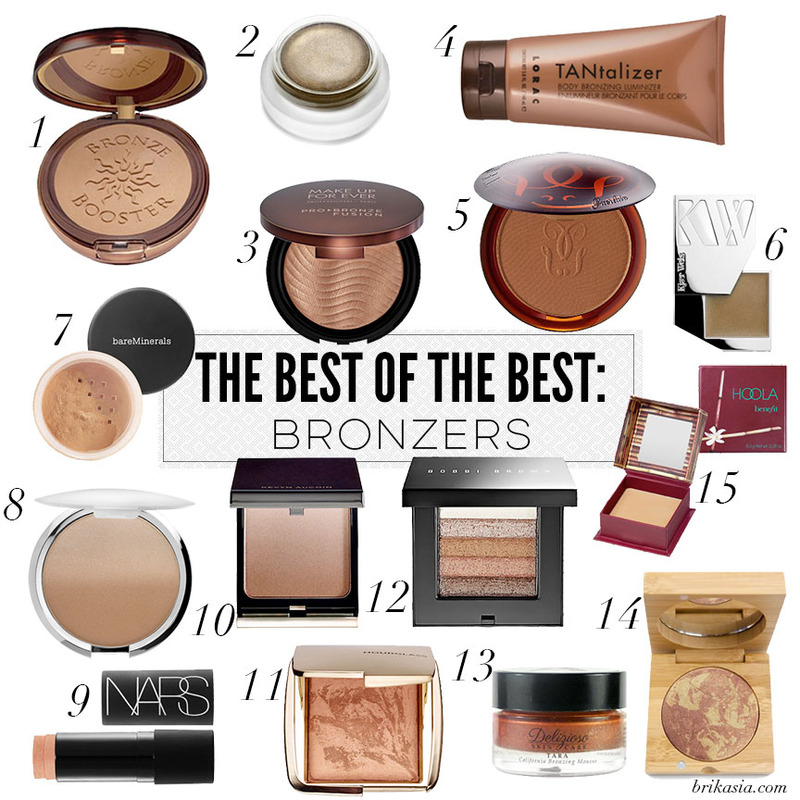 And now, for my definitive list of best bronzers EVER. What are some of your favorite bronzers? I'm not really a bronzer girl, but your post and all those great photos has made me want to try again! I'm fair, too. I love Too Faced Chocolate Soliel, Benefit Hoola, Nars Laguna... I have found that deeper bronzers, applied with a very soft brush and a deft hand work better for me than light toned ones that tend to make me look orange. What a stunning list! The one from RMS looks absolutely gorgeous! I love that you included everything from drugstore to luxury bronzers on your list! Great choices! I need to add a few of these to my wish list! My favorite bronzers as of late have been NARS Laguna (classic staple), bareMinerals Be Ready bronzer in The Skinny Dip, and the Too Faced Chocolate Bronzers! What a great collection of bronzers. Each is so beautiful. I don't use bronzer often because of the paleness of my skin but everyone is used to that with me. Oh my gosh - I will take one of each. This is such a fabulous collection. The Shimmer Brick is one of my all-time faves. Thanks for leaving a comment on Brikasia! Please do not promote your blog in the comment section, or ask for a follow-for-follow, or promote your giveaway, or anything else that is self-promotional. Thanks!